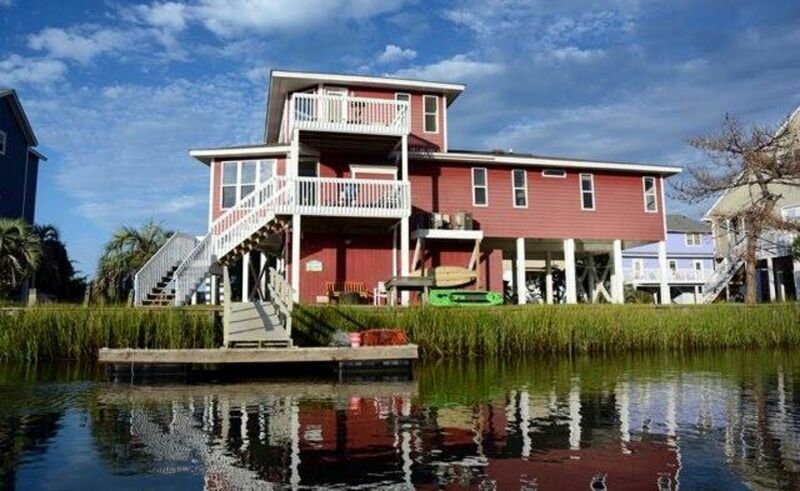 Canal home at the end of a quiet street with beautiful marsh and Intracoastal views! All (6) brand new top quality memory foam mattresses for 2018 for a better nights sleep. Just a short 5 minute walk to the beach. Sleeps 12. 4BR/3BA. King in an oversized private master suite upstairs with private balcony with views of the marsh. Downstairs there are 3 bedrooms and 2 bathrooms: Q, 2D, 2D. Amazing 180 degree views in this fantastic beach cottage at the end of a quiet street on the west end of OIB. Views of the OIB Bridge and the ICW from the front porch. Private tidal dock in the back on a natural canal. This canal is not suitable for boats because the canal is not deep enough. The canal is perfect for kayaks and paddle boards and for fishing and crabbing during high tide ONLY. Explore the coastal marshes with beautiful birds, crabbing and great wildlife. Fish, kayak, paddle board, and explore more from your back yard! Fully equipped kitchen, large dining room table, and comfortable living space. Decks on the front and back of the house to take in commanding views. Other amenities include large flat panel television in living room, flat panel in master, DVD player in living room and master bedroom, wireless internet access, pack 'n play, outside hot and cold shower, gas grill, washer/dryer, dishwasher. Explore all the island has to offer with an owner provided kayak, paddleboard, crab pot and fishing poles (condition cannot be guaranteed). Dog friendly property with an additional non-refundable deposit per dog. Limit 2. Non-smoking. Location, condition, comfort, cleanliness, amenities, BEDS, views, cost, EVERYTHING, was Top Drawer! Great Experience We'll Return Soon!!!! Just spent a girls retreat here and enjoyed all the comfortsof home - at the beach. This house is so welcoming Having the open living, kitchen and eating areas invites group participation, whether it be playing games or preparing meals. The canal and waterway location and multiple porches make for perfect water fowl viewing day and night. Sunrises and sunsets are spectacular Fishing, crabbing and kayaking are accessible right off the dock. Its the perfect family getaway.